Never go out on the ice alone. Go out with another person and keep a good distance apart as you move about. If one of you falls through, the other can attempt to get help. That person can also attempt a rescue. Carry some survival equipment, such as a length of rope. Carry a pair of ice picks or even a pair of screwdrivers tied together with a few feet of strong cord. You can use these to pull yourself up and onto the ice. If they have wooden handles, they will float, which is handy if you drop them in the struggle to get out of the water. Avoid driving on the ice if at all possible. If you must drive onto the ice, unbuckle your seatbelt and roll down the window. That way, if you go through the ice, it will be easier to get out of the vehicle. If snowmobiling at night, don't outdrive your headlight. Give yourself time to spot and avoid open water, pressure ridges, and patches of weak ice. Perhaps more than anything, avoid alcohol. Alcohol increases your chances for hypothermia, impairs your judgment, and slows your reaction time. Whether you have fallen through thin ice or are trying to rescue someone who has, the most important thing to remember is - you have more time than you think. Try not to panic. Call out for help only if you see someone. Otherwise, save your breath. The cold shock that makes you hyperventilate will subside within 1-3 minutes. The best thing to do is get your breathing under control and keep above water. You are more likely to die from drowning than from hypothermia. Remove any extraneous objects that will weigh you down (skis, snowmobile helmet, skates, etc.). Try to get out from the direction that you came in. Place your hands and arms on the unbroken surface of the ice. You will only have 2-5 minutes before you lose the strength to pull yourself out. Begin kicking your feet to get your body horizontal. Then, pull yourself along the ice until you are out of the hole. Be slow and deliberate to conserve your strength and body heat. If the ice breaks, move forward and try again. Once you are lying on the ice, DO NOT stand up. Roll away from the hole, then crawl following your footsteps back toward shore. Don't stand until the hole is well behind you. You want to distribute your weight evenly over a wide area to prevent going through again. If you can't pull yourself out within 10 minutes from the time that you went in, cease all attempts. At this point, you need to extend the time period in which someone else could rescue you by conserving body heat. The body loses heat much faster in water than it does in air, so get as much of your body out of the water as possible. Keep your forearms flat and still on the ice. Hopefully, your clothing will freeze to the ice, possibly preventing you from going under, even if you become unconscious. It is possible to survive for up to 2 hours before succumbing to hypothermia. In other words, if you stay composed and keep above water, you have almost a 2 hour window of opportunity to be rescued. Keep calm and try to keep the victim calm. Assess the availability of extra help. If possible, call 911 or look for people in the vicinity. If you are on the ice, DO NOT run up to the hole. If you are on shore, DO NOT run onto the ice. The last thing you want to do is become a second victim. Use an item on shore to throw or extend to the victim that will allow you to pull them out of the water (rope, ladder, branch extension cord, skis, jumper cable, etc.). You can also form a human chain with people lying flat on the ice to distribute the weight as evenly as possible. Once the victim is safely on shore, they may seem to be in relatively good condition. However, a potentially fatal condition called "after drop" can occur soon afterward. Cold blood that has been pooled in the body's extremities starts to circulate again as the body warms up. At this point, the body begins to shiver violently in an attempt to raise the temperature again. Never rub the victim's arms, hands, legs or feet, as this could cause or exacerbate the "after drop" effects. Never give the victim alcohol or caffeinated products. They restrict the blood vessels and slow circulation. If possible, exchange wet clothes for dry clothes, wrap the victim in a blanket and get the victim out of the elements. Get an ambulance or rescue squad to the scene as fast as possible. "Thick and blue, tried and true - Thin and crispy, way too risky." 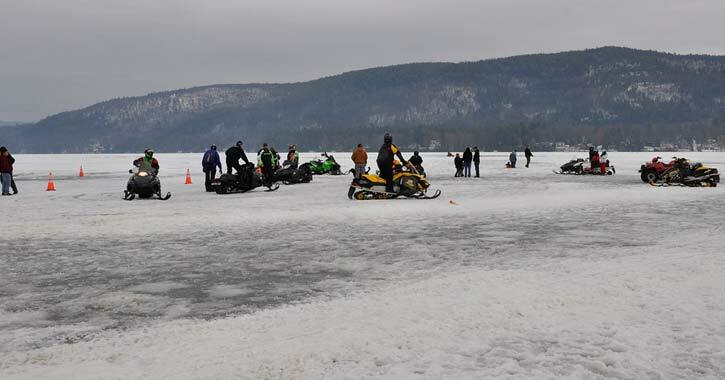 The Lake George Association is a 501(c)(3) not-for-profit membership organization, dedicated to protecting, conserving, and improving the beauty and quality of the Lake George Basin. Hey, everybody. It's Scott here with lakegeorge.com. We're out here on Harris Bay and we're gonna talk ice safety. So, the first thing to keep in mind when walking out on the ice is that there is no such thing as safe ice. Every time you walk out on a frozen lake, there's a risk that's going to come with it. So, don't walk out on the ice thinking that it's 100% safe because it never is. This tool right here is called a spud bar or an ice chisel. This is the homemade variety, but you can buy these things. It's pretty heavy. It's sharp. If you're gonna be spending a lot of time out on the ice, you should probably get one of these. If you're just gonna go out every once in a while, try to go with somebody that has one so that they can use it and show you how to determine whether the ice is safe. Before I even step on the ice, I did it over here on shore, I like to give it a couple pokes because if it's not safe, if there's only one or two, you know, two inches of ice, that's not gonna hold my body weight. This is gonna go right through it. So, I give it a couple. So, I just gave that four or five jabs, probably four inches into the ice, five inches into the ice so far, and I don't see any water so we're in good shape. I'm gonna cut a hole and then we're gonna look at the layers of ice and talk about how thick it is. So, I just cut this hole in the ice. We have about eight inches of ice right here where we're standing, about five inches of good, black, strong ice, and then about two or three inches of this gray, white stuff on top. The dark, black, clear, solid ice is what you're looking for. You need about two or three inches for one person to walk on, five inches of good...four or five inches of good, black, solid ice is good for a group of people to be out on. You know, all kind of together. And I think most people will say that 8 to 10 inches of good, solid, black ice all the way through is good for a car to drive on. Now, I'm not driving my car on eight inches of ice. I'm gonna wait until there's a least a foot of good strong ice to drive my car on, and I'm actually probably gonna wait until I see someone else driving their car out here before I try to bring mine out because it's really not worth the risk. ATVs, snowmobiles, stuff like that, probably six inches is fine, maybe five if it's good and solid. The thing about ice is, just because there's eight inches of ice here, doesn't mean that there's eight inches of ice over there. So, you can't assume that it's one uniform layer of ice because there could be stuff going on underneath the surface that we don't know about that affects how the ice forms. Inlets and outlets, you know, water running in and out of a body of water will cause the ice to be much thinner. Docks, you should stay away from docks. People put ice heaters and bubblers and stuff on their docks to keep the ice away because the ice will ruin a wooden dock. So, don't go near any docks if you can avoid it. Any culverts or anything coming from under the road, stay away from those. Any time water is flowing in or out, there's potential for the ice to be quite a bit thinner than it will be in the base. Also, as you work your way out into deeper water, the ice takes a little bit longer to freeze. So, out here on Lake George right now, the middle of the lake isn't frozen at all. It's all wide open and we have eight inches right here. So, it's gradually getting thinner and thinner as we work our way out. When you're going out on the ice, cut a hole, make sure you know what you're looking at, bring the spud bar. 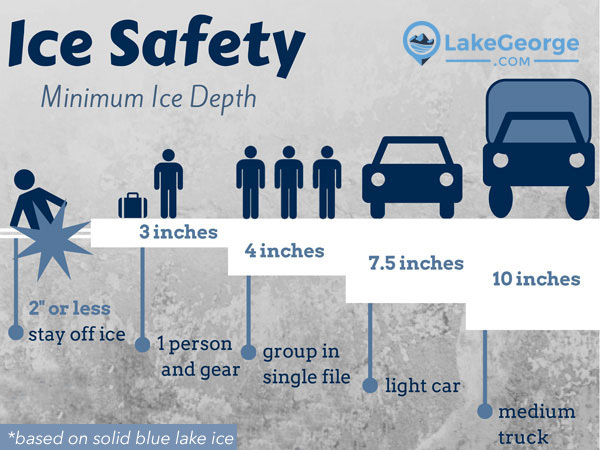 If you're parking on the ice, cut a hole next to your vehicle, and if you see water start coming up through that hole, that means your ice is sinking and you need to get your car off the ice as soon as possible. And again, just keep testing. Keep testing the ice, you know, cut a hole every 50 feet or so, keep that spud bar in your hand and keep knocking on it as you work your way out so that you don't have an accident. Number one tip, there's no safe ice. There's no such thing as safe ice so don't think that the ice is 100% safe and number two tip is always bring someone with you. Don't be heading out here alone, you know, in case you have an accident there's someone there to assist you. So, good luck. Be safe.